Went in to The Old George and had a pint a few times and always see different beers on. 3 ales offered this time was Greene king ipa. Penguin rockhopper ruby and ringwood old thumper. Tried all 3 and all top quality as was the staff. Should be a lovely pub, it has a lot going for it, but sadly it is a bit hit and miss. The landlords can be the same, one day they are very friendly and on yet on another day they are completely the opposite. Everyone who works there must presumably live in the village as they all seem very caught up in village politics and don't seem to worry about discussing the personal business of other people in the village in front of customers. Apparently they now have a new chef as, if gossip heard when staff were talking to other locals is to be believed, the old chef left because the landlords messed him about with his salary and he didn't have fully working equpiment in the kitchen: the food is still a bit hit and miss and the whole place is a sticky and grimey in places. A real shame as with a bit of effort and maybe a bit less nepotism it could be a fabulous place: maybe if the landlady had a few less holidays (she always seems to be going off somewhere) and instead spent a bit more money on things like cleaning, essential equipment and paying her staff properly, the atmosphere in there might change for the better. This is a lovely pub! 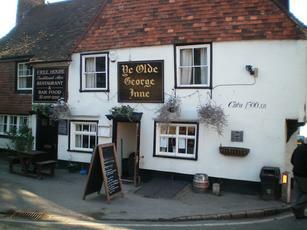 We popped in here whilst walking to Otford along the Darent Valley, which is a nice walk in itself. They had a gorgeous coal fire warming the place and a nice selection of ales. I can't understand the low rating – must be old scores from previous tenants. The bar staff were charming and there was a great ambience here. Will be back! Visited last week. 2 Northumberland Brewery beers on (where are the Kent local beers?) and Harveys. Had the Harveys Sussex Bitter which was not at its best. And at �3.50 for that quality we won't be visiting again for some time. Stopped here for lunch on a cold winter's day. They had two roaring fires going which was very welcome. Beer was "Gravesend shrimpers" bitter and "Wolf in sheeps clothing" mild. I hadn't heard of either before but both were in pretty good nick. The pie & veg I had was excellent but others thought their food wasn't served hot enough.